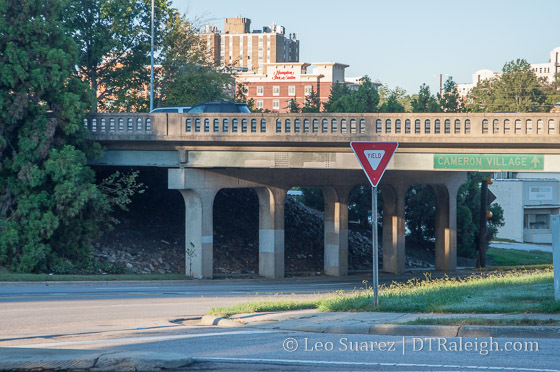 During last week’s city council meeting, there was a presentation with the latest updates on the bridge replacement projects that are going to take place on Capital Boulevard. This is a topic that’s been covered here on the blog for almost five years and we’re now under a year until construction starts. In addition to the Capital Boulevard bridge over Peace Street being replaced, Wade Avenue at Capital is also being replaced. If the video does not show for you, click here. The project will remove the Jersey barriers and glare screens going down the middle of Capital and a landscaped median will be put in. Seeing as how this is an NCDOT/City of Raleigh collaboration project, NCDOT will cover base costs with Raleigh covering enhancements like aesthetics, lights, etc. The city’s share for the project is now estimated to be between $12 and $13 million. During construction, one northbound lane on Capital will be closed for about two years. At some times, Capital will be closed entirely but crews will focus on nights and weekend closings. The official detour will be to use Blount Street and Person Street/Wake Forest Road. The new bridges will have an art deco design maintaining a theme with nearby railraod bridges. Rendering of the bridge going over Peace Street with columns. Click for larger. The major enhancements of each bridge primarily revolve around adding either lights or decorative columns or both. As you can see in the rendering, the columns could have public art on top of them of some sort. Only a concept is shown in the rendering not the final art piece. Of course, the more you add, the higher the cost becomes. City staff broke it down into four available options. Full breakdown of costs for Peace Street. Full breakdown of costs for Wade Avenue. Those figures make it seem like lights are a $200,000 cost per bridge. The columns come in around $400,000 per bridge. Option 3 seemed to be, according to the light conversation, the one councilors preferred but no decisions were made at this time. There is still more work to be done to prepare an agreement with NCDOT and when those details are more solid, there will be a followup presentation. That will probably take place in a few months. Construction will first start at Wade in July 2016 with Peace Street seeing work in July 2017. Everything should wrap up during the Summer of 2019. 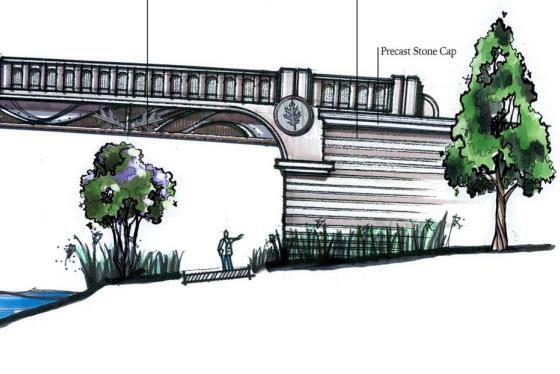 On a slightly related note, I haven’t covered the Wade Avenue bridge much but I did notice this one little jewel in the renderings. 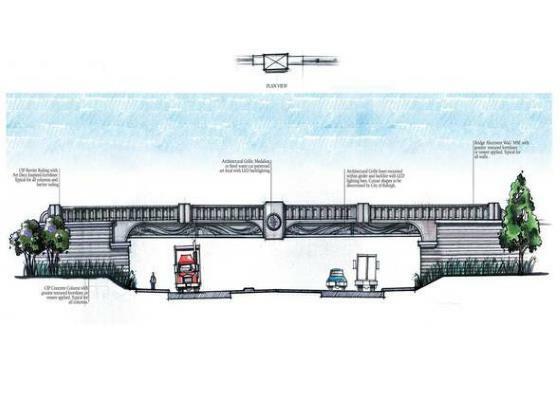 Take a look at the Wade Avenue bridge design below. The right-most portion shows a greenway trail going underneath. Rendering of the Wade Avenue bridge with columns. Click for larger. We know that the city wants to get a greenway to go along Capital and the Pigeon House Branch Creek which is mostly buried. In the future, the creek may be opened up and we all can walk or bike along it starting from a park that sits just north of Peace Street between Capital and West Street. The rendering suggests that there are plans to keep a connection open here at the bridge for such a future project. Good stuff! Who chose Art Deco? Seems so out of character for Raleigh, or at least the Raleigh we are trying to build. Faux-old is disappointing. Why not something modern? It was a recommended style from the Raleigh Arts Council, IIRC. I’m with Justin here. Why in the hell does that bridge need to look Art Deco? Not only does that seem silly to me but it’s out of character for the city’s historical built environment. Who thinks of Raleigh and Art Deco together? This doesn’t make sense. It would also seem to me that all of this excess ornamentation would drive the costs up when that money could better be used to enhance functionality of the two bridges, the associated roadways underneath, adjacent amenities like greenways & landscaping, and integration of technology to enhance the user experience and art like L.E.D. lighting features. How do we weigh-in on the silliness of this design aesthetic? Is it too late? No, you’re right – let’s spend millions of dollars on a new bridge that looks just as boring and characterless as the current ones, that makes great sense. Come on y’all – a little flare can go a long way. Thank you, Jake! This bridge will be seen my millions. We have the resources to make it look good. We are a rich city, but don’t have the quality and quantity of fine monuments that most cities our size have. So let’s build them!!! And yes, Raleigh has few surviving Art Deco buildings. But our finest downtown building is in the Art Deco style — the Durham Life building, now the County office building, on Fayetteville St. And the N.C. State Bell Tower is in the late phase of Classically-influenced Art Deco. As is the current bridge. These proposed bridge designs are fine and beautiful and impressive. Much better than most of the recent bland crap that is following the latest fad. @Jake and Matthew. Nobody has asked for the bridge to look boring. clean, current and modern design can be spectacularly beautiful. I am only questioning the choice of an Art Deco aesthetic that will clearly come with the added cost like an over-detailed wedding cake. That decision has practically no basis in the history of design of Raleigh and certainly doesn’t follow a pattern of design in the city. Art Deco provided during the Art Deco period is a different animal and should be preserved but it doesn’t mean that we cherry pick fleeting design aesthetics and reproduce them almost a century later without much context. While one can identify very few Art Deco examples in the city, it’s hardly the city’s identity. Perhaps Dorton Arena should have been historical instead of the iconic piece of contemporary architecture that it was designed to be? Perhaps the Nature Research Center should have been designed to look like a giant plantation instead of the smart International Style it is with its iconic globe theater? I think you get my point. Architecture and design should always aspire to be the best it can be and of its time. If in fact this was a bridge replacement that WAS already Art Deco, I could see the validity of replacing it as such. However, this is not the case. Putting an out of place piece of Art Deco design in such a prominent location for the next 60-odd years is a huge mistake that won’t be recognized until it’s too late. I like it! I’m a sucker for Art Deco design though. There’s also nothing Art Deco about that location. Something could play off of the nearby Archdale Building or the AIA building. Or a brick design to match a warehouse/rail yard motif. Red brick is certainly more “Raleigh” than Art Deco. I think that the Neo Art Deco looks great and adds a certain monumental character which is needed downtown (especially so close to the government complex. IMO Art Deco in 2015 is creating fake character. Something more modern that isn’t boring is the way to go. Why rehash the past when design has moved on? Art Deco is better than more red bricks. It’s like everyone born here has some sort of defect with their eyes, where they think red brick is attractive. I happen to like the Art Deco design elements… I am glad that they were thinking out of the box! It seems that some folks like to stay in a singular design style for everything, born here or not! I, as a native, would have liked to tear down a good portion of the square brick buildings… and build new… in a contrast of styles. Some uniformity is good… but it should not be the only game in town! I think about certain cities in which the architecture is as diverse as its citizens… progressive cities… ever changing and evolving! Raleigh, in its past, had several interesting Art Deco buildings… tore down and replaced… a part of Raleigh’s history.. mostly gone but not forgotten!